Chris “Cookie” Colbourn surprised us all last year when he knocked P-Rod out of BATB X in the first round. I say this not to denigrate Chris’ skating in any way (anybody who has seen him on the rise in the past 3-5 years can gush over his endless trick selection and notable creativity); I say this because betting on P-Rod is generally a safe, conservative bet. Omar Little echoed the eternal words in The Wire: “You come at the king, you best not miss.” Well, Chris’ b/s 360 kickflip was a bullseye. Chris is full of surprises outside of BATB, as well. From his Element intro part in 2015 to his We are Blood clips, to, well, everything else, Chris slowly changed the public perception from “who the hell is this guy” to “what on earth is he going to do next?” Follow him on Instagram, appropriately titled @coookie_doe, and you’ll see that he has no problem throwing down just about any trick on any terrain. Surprise after surprise, this Cookie is someone you’ll want to keep your eye on. 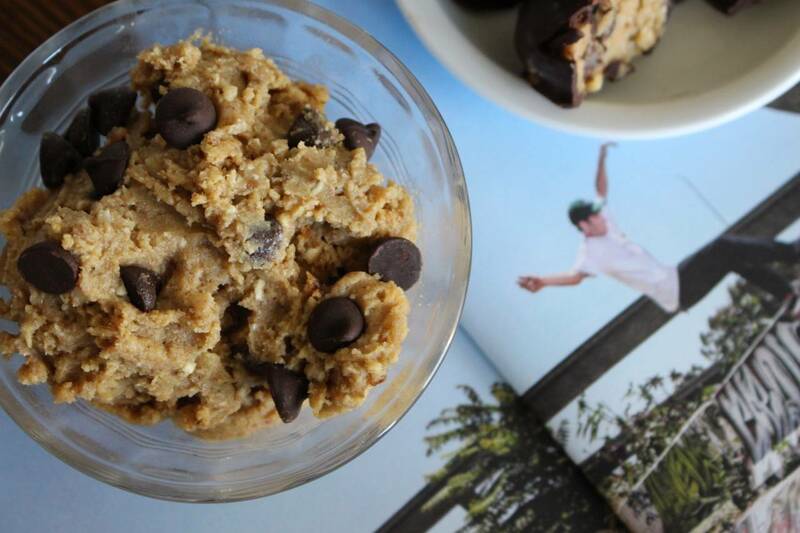 Speaking of cookie dough and surprises, I came across a recipe this week from The Beaming Banana that opened my eyes to some new, amazing snacking possibilities. 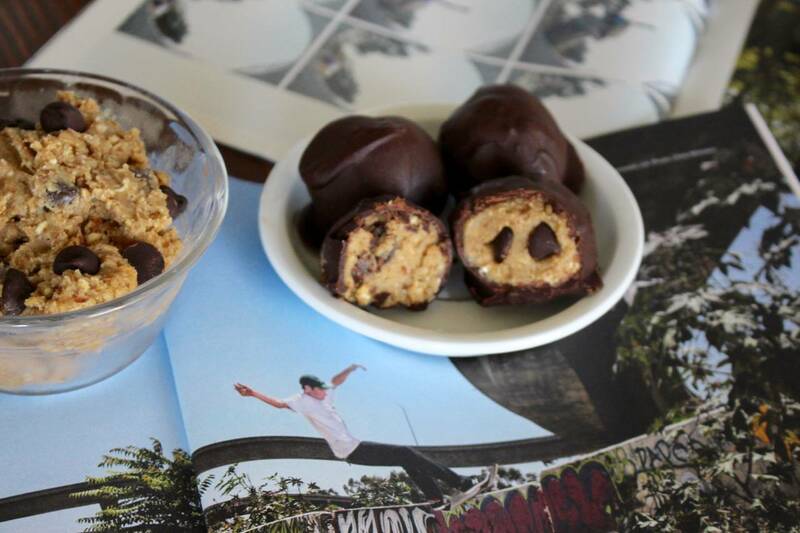 Just like Chris prefers to steer away from the conventional, I think we can all agree that snacking on cookie dough is better than the conventional method of baking cookies. When I came across a cookie dough recipe that didn’t involve eggs or granulated sugars, I had to try it. Believe it or not, the original recipe from Beaming Banana called for just oats, chickpeas, water, dates and chocolate chips. I understand the skepticism. 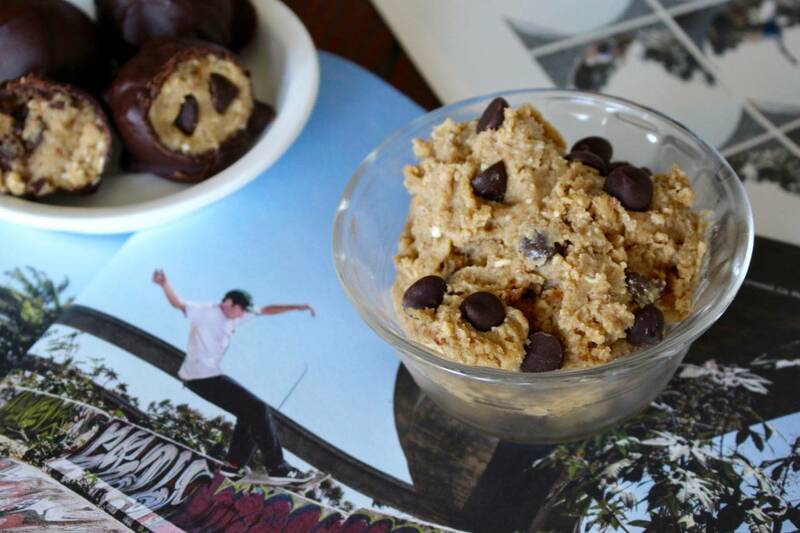 What’s the fun of eating cookie dough without the lingering threat of salmonella? I was skeptical too until I tried it. Naturally, though, I wanted to take it just a step further. Spooning cookie dough mindlessly into my gullet is great, but what if I could mobilize it? Could it be turned into manageable bites? Could I add more protein? Could I coat it in chocolate? The answer to all of the above is a resounding yes. While staying true to the primary tenets of the original recipe, I’ve managed to thicken these up a bit, add some more protein, and then coat them in delectable chocolate. 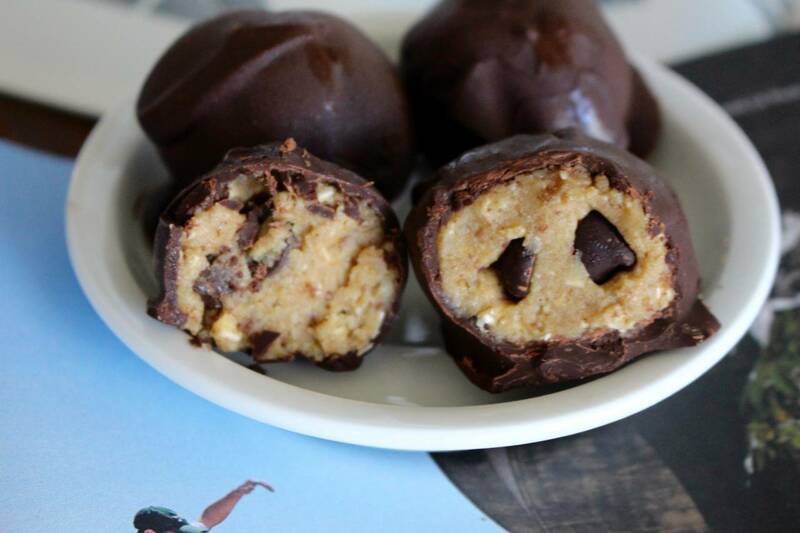 The result is a mouthwatering cookie dough bite that packs some protein, potassium, and fiber. Like Colbourn, these bites take the conventional and turn it on its head. Pit those dates and toss them into a food processor with the chickpeas, oats, cashews, water, almond flour, protein powder, and vanilla extract. Blend it all up for 2-3 minutes or until it’s a smooth, creamy mixture without any chunks of dates or oats. You want the mix to be somewhat thick, but not as thick as traditional cookie dough. If you need to thicken it, add more almond flour. Remove from the food processor and stir in the chocolate chips for mixing. Once the chips are mixed in, roll the dough into balls 1-2” thick and place them on a parchment-lined baking sheet. Freeze them for an hour or two or until they are hard enough to be picked up without being dented or warped. Using a double boiler (don’t have one because you’re not a fancy millionaire chef? Me neither. You can fashion one using the method I previously described here), melt the rest of the chocolate and stir in the coconut to thin it out. Stick a toothpick into the top of a cookie dough bite and place into the melted chocolate, coating it generously. Place it back on the baking sheet to cool and remove the toothpick so the entire bite is covered. Repeat until all of the bites are coated then freeze for another hour before eating. These can be kept in the freezer, just thaw them for 10-15 minutes before eating so you don’t break your jaw! Trevor McClung recounts what was going through his mind while filming this monstrous kinked hubba clip for Etnies’ Album. One trick from most of the team.